Did the ACBO fire Roger Lawler for his pro-abort promotion? They have brought back a retired Gen Secretary from 3 years ago! What is the nature of Lawler’s departure? We pray he and his family are healthy. Were his tweets just too much for the Bishops? Posted on April 29, 2017 Leave a comment on Did the ACBO fire Roger Lawler for his pro-abort promotion? Ple write respectfully to Absp Prendergast!! We have written before how anti-Catholic and radical Jer’s Vision/CCGSD is. No surprise that the OECTA president, Ann Hawkins will be presenting at their conference!! As well, Jer’s Vision is pro-abort and Ann Hawkins signed the pro-abort FAFIA letter. Dr. Murray Watson is a Catholic theologian, and a gay man, who has worked widely with Catholic educators and leaders over the last 20 years, around issues of inclusion, diversity and bridge-building. Over the past 10 years, secularism has been spreading noticeably. Cultural influences, such as individualism, consumerism and moral relativism, continue to have a negative effect on the faith of our people. To a certain extent, our society tolerates people who profess religious beliefs, but many today are advocating that these beliefs are private and have no place in the public square. Faced with these negative cultural forces, the dioceses of Ontario are strengthening our efforts to carry on the Church’s mission of evangelization, seeking to build vibrant, welcoming parish communities and to support Catholic institutions, such as our schools, universities and hospitals. We are taking steps to assist our people to grow in holiness and to be more confident in their baptismal call to witness to their faith and to reach out to their fellow Catholics who are not going to Church and to others in our society who are hungering spiritually. Recognizing the grave threats in our society to fundamental human rights, we are entering ecumenical and interfaith partnerships to speak with one voice for the rights of people, especially the unborn, the vulnerable, the poor and the marginalized. Thanks to the strong faith of those who have gone before us, the Church is well established in Ontario. There is a solid core of the faithful who remain firm in their Catholic faith and are committed to passing it on their children and grandchildren. +Most Rev. Ronald Fabbro, C.S.B. They don’t mention the plummeting weekly mass attendance (down to 15% overall, and much less for gen X and millenials – Source Reg Bibby). 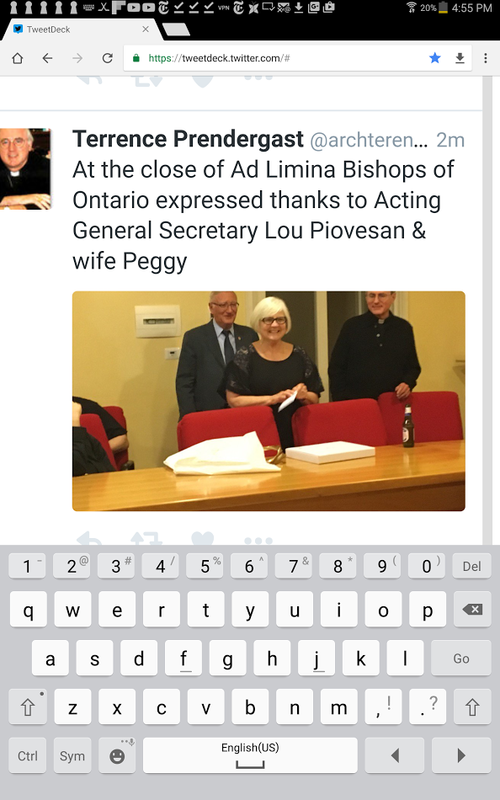 The Catholic Church in Ontario is in freefall and the ACBO is telling Rome all is fine!! Ontario is rapidly becoming like the church in Quebec. Pope Francis has called Gender ideology “diabolical”. OCSB pushes demonic ideas on 9 year old children!! above calls it voluntary and clear directions on opt out..